is decorating her cage for autumn. She chose to display her toy that looks most like a pumpkin. This dilute tortie was rescued in Holbrook 2 months ago. Now 6 months old, she’ d like to add color & delight to your household. 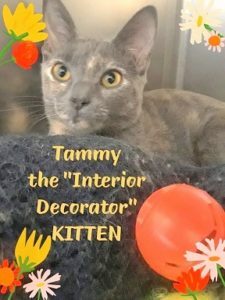 This entry was posted in 6 to 12 Months, Adopted, Cats, Female, Wantagh Adoption Center. Bookmark the permalink.